Talking about the moon in a series on common hormonal imbalances most likely sounds a little weird. But what can we say: we believe in the power of nature and our place as animals immersed in it! 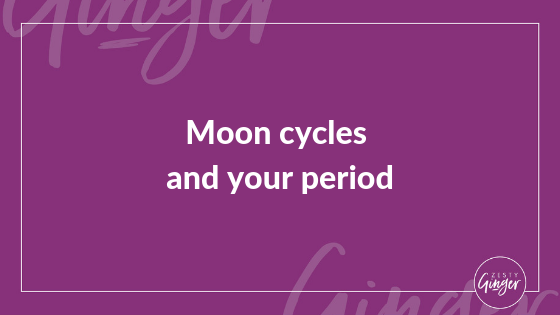 We originally brought in moon cycles to our 4 Phase Cycle approach,so women without a cycle or with an irregular cycle had an external 28-ish day cycle to follow. However, we’ve learned so much more about the moon in our work with ladies that we’ve chosen to incorporate it even more into our programs. There is something magical about the cycle of the moon, and its relation to the ebbs and flows in the female body. For millennia, the moon connects to the feminine, The Goddess, the partner to the Sun. Female mammals tend to sync their menstruation and fertility to the cycles of the moon. And humans aren’t too different! When humans lived more in touch with nature–without artificial lights and the like–it was common for the majority of women to menstruate during the new moon and ovulate with the full moon. Women who functioned as healers tended to menstruate during the full moon and ovulate during the new moon. By being “off-cycle” from the other women, they were able to take care of the other women they lived around. While we don’t have the data to back this up, we’ve noticed that quite a few of our ladies who work with healers fall on this schedule, so it’s possible that this still plays a role in our society as well. We tend to predictably sync up with the moon when we spend more time out in nature, especially at night and away from artificial light sources. Since our 24-hour circadian rhythms are normalized by this as well, it’s not too surprising that our hypothalamus and pituitary also get regulated by the moon. What was VERY interesting is that both of us transition into the “normal” pattern when we encounter times of stress (as in, we’ll get an early period, or it comes late) and then revert back to the “healer” pattern when life calms back down. Even though we don’t live together (or even in the same state for that matter! ), our cycles tend to align around the year. We think it’s a testament to how little we actually understand about how our female cycles get regulated. There’s no “scientific” reason that our periods should align if we aren’t around each other. Yet, we are cycle sisters, and that’s just how it is! If nothing else, the external cycles of the moon are fascinating to follow. We love the Moon app and the My Moon Phase app for keeping tabs on what La Luna is up to in the sky. We make it a point to do some type of ritual self-care activity during New Moons and Full Moons. While we don’t get as witchy about this as some other folks, we do it because we love the excuse to dedicate some time for showing yourself love and spending some time in nature. Megan often creates vision boards and wishlists with her daughters at these times to get them involved in nature. And Alex loves cold-brewing an intention tea out in the yard or planting new seeds–literally–in a pretty pot. On an even more spiritual level, going outside to look at the moon reminds us of how vast this universe we live in really is. It’s hard to be mad about what that person at work said or what your partner didn’t do when you’re gazing deep into the depth of night. Our time is precious here, and it’s worth realizing what’s important and what isn’t. For us, we’ve realized that our health and our ability to show up in the world as creative and empowered females is of significantly high importance. This is why we make it a point to work on balancing our own hormones and have dedicated our careers to working with women to help them improve their hormones. Thank you for joining us for this series! If you’re ready to take control of your body and figure out your personalized toolkit, we’d love to see you in our Healthy Hormones Group Program so that we can show you how!